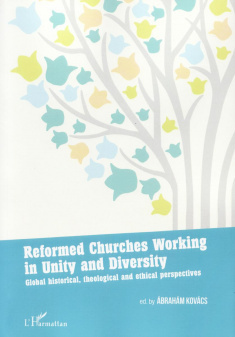 Global historical, theological and ethical perspectives. Edited by Ábrahám Kovács. This volume is the result of an international conference entitled "International Calvinism: A Unity in Diversity? Interactions between International and National Calvinism(s) during the Era of Liberalism and Totalitarianism". The event was organized by the Research Institute for the Historical Study of Central-Eastern European Reformation and Protestantism and István Hatvani Theological Research Centre of Debrecen Reformed Theological University in cooperation with related institutes of University of Debrecen. It was held in 11-15 April, 2015 in Berekfürdő and Debrecen, Hungary. Distinguished scholars arrived to this event from South Africa, Australia, the USA, Japan, and South-Korea as well as from Europe such as Scotland, England, the Netherlands, Switzerland, Hungary and Romania (Transylvania). The idea of celebrating a unity within various forms of Calvinist faith emerged as it was in 2015 when the Reformed Church of Hungary commemorated the establishment of the foundation of a bursary scheme of the (Free) Church of Scotland that enabled Hungarian students with its generous scholarship to study at New College, Edinburgh since 1865. This special occasion motivated the conference organizers to explore how international Calvinism worked across countries and time. Out of the fruitful discussions the following papers emerged for publication which is believed will enrich our global understanding of how widely Calvinism impacted societies across the globe (Africa, Asia, Europe, Australia and the Americas) through its social, pedagogical, economical and ethical principles. The book is unique since it places a wide array of essays to the reader from an enjoyable intellectual enterprise and forces you to move you out of your theological disciplinary comfort zone. The first thematic group of historical papers scrutinized the theological, social and pedagogical influence of Calvinism in countries like Scotland, Hungary, England, the USA, Transylvania (Romania). Essays in the second section focused on the theological concepts. It deals with the relationship between Calvins's view of trinity, the African concept of Ubuntu, the Sanctification of French Protestant, and on Calvin's Academic legacy. Finally the last section focused on mission of Reformed Churches in response to the socio-political environment in the USA, sola caritate as a response to the economic justice, collaboration in the ecumenical movement, reinterpreting work and vocation for a changing political landscape, and the issue of how to heal tensions between denominations.